A solution that is easier to implement than a micro-grid, yet giving the same functionality in a distributed way with local ownership, local viable businesses & livelihood creation. A modulair solution, combining the best features of a micro-grid and a solar home system. Positioning itself in between a solar home system and a micro grid, the decentralised solution of Rural Spark generates the capacity of an average Micro-Grid at lower costs, with a strong sense of ownership. Instead of having one central building with solar panels, Rural Spark offers a decentralised solution in which individual Local Energy Suppliers generate an equal amount of energy. Providing it to their fellow villagers, feeling ownership, earning income, creating livelihood and reaching even the poorest in a village without extra effort from Rural Spark and its partners. 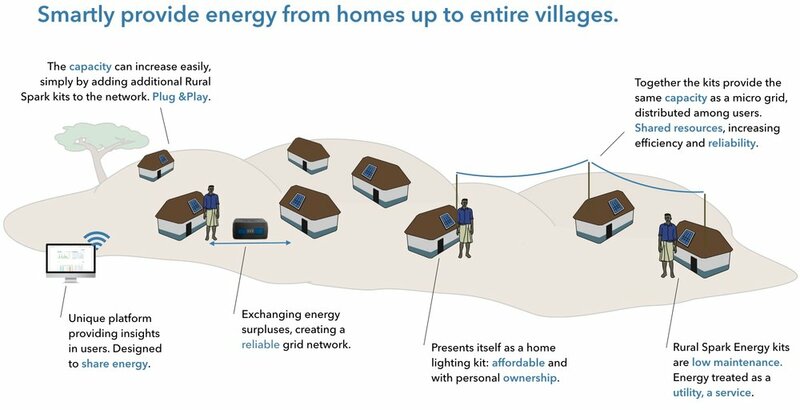 Decentralised and easy to increase village capacity while presenting itself - in size, price and ownership - as a solar home system. The Rural Spark Service Platform supports the complete value chain. Rural Spark kits have clear competitive advantages compared to traditional Solar Home Systems and Micro-Grids, combining the best of both worlds. Generate business opportunities for yourself and users of the Rural Spark kit. Create and develop markets. Stimulate development. Rural Spark Energy Kits allow users to become ‘Local Energy Suppliers’ who provide energy to their fellow villagers. Exchanging energy surpluses, together they create a network that is reliable and distributed. Local Energy Suppliers proof to be value-conscious entrepreneurs who are much better in designing a local business-model, respecting local context and characteristics. However, not only do they earn additional income, they also increase their confidence, self esteem, entrepreneurial skills and social status in their village. Empowering villagers, they become more independent confident and self sustainable, critical in enhancing social and economical status. For the village, the Local Energy Supplier(s) become a central hub in the village, where they go for their energy needs, creating social cohesion. A close community forms, showing the vast social effects of sharing energy. that’s even able to bridge social and economic gabs on village level. The deriving of this community, allows for other village development programs to be enrolled more easily.